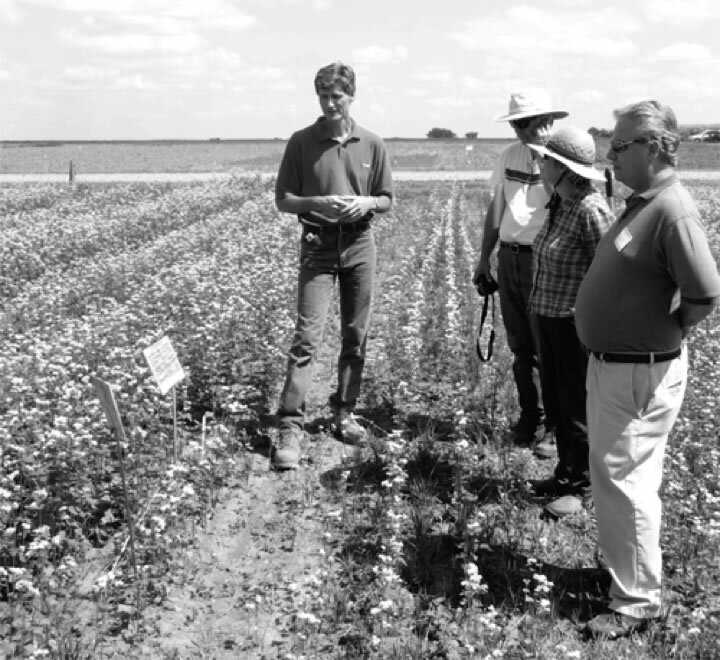 The fifteenth annual Northeast Buckwheat Field Day was held August 25, 2009 at the research farm of Cornell’s Geneva Experiment Station. Rain has been the story of 2009, and the benefits of proper field preparation were demonstrated in several ways. When the ground stays wet, there are fewer opportunities to work the ground, and the temptation to work it wet can get big. We considered what happens if you work the ground and plant just before it rains (because it is the only chance you have) or no-till into ground that wasn’t already established as no-till, and therefore lacking the pores for roots to grow. Whether to work wet ground or plant no-till is a tough dilemma, as is whether to plant into a storm when you are running out of season. We prepared a harvested wheat field for buckwheat, but left part of the field untilled. At planting time, we drilled the whole area. In a part of it, we irrigated an inch in an hour, then we had about half an inch of natural rainfall over the next day. The irrigated part had standing water for a few hours. The result was decent growth in the area that was tilled and got only rainfall, with no puddling. The irrigated part had virtually no buckwheat come up. The untilled part had rapid emergence, but the plants quickly stopped growing. Neither way of dealing with exceptionally wet weather gave a usable stand. Maintaining good soil condition increases the opportunities to work the ground in a wet year. Buckwheat not only benefits from good soil condition, but helps improve it. Pictured: farmers Bob and Shirley Barton of Schuyler County, and Cliff Orr from Birkett Mills discuss fertility with Professor Thomas Björkman of the Geneva Station. They are standing on buckwheat that was no-tilled into wheat stubble. At the field day, Cliff Orr reported that buckwheat plantings are up about 20% from last year. Even though the price this year is a little lower than last, the price of other crops has dropped a lot more. Birkett Mills contracted at $17 per hundredweight, with a $3 premium for organic. There’s no longer a minimum size for the organic premium because individual lots no longer have to be kept separate. The small-acreage growers at the field day were particularly interested in this change. In the Northeast, buckwheat is mainly pollinated by honey bees. It has an unusual flower that in some ways seems specialized and in other ways is designed to accept any insect pollinator. The behavior of pollinators in its ancestral range in the Himalayas can shed light on how its pollination system evolved, and on how to optimize pollination here. A Nepali scientist, M.M. Singh, looked at pollination by the Himalayan bee. They found that excluding all flying insects reduced yield markedly. Apparently, ants were not a substantial pollinator here, in contrast to the Japanese trials reported in the last newsletter. Adding lots of Himalayan bees to the cage increased yield slightly over the naturally pollinated ones. Thus, natural pollination was quite good, but just at the edge of adequate. They don’t make clear whether it was because there were just barely enough natural pollinators or whether their caged bees spent more time on the flowers simply because had nothing else to do. Earlier this month, buckwheat cutting and binding was one of the demonstrations at the Tioga (PA) County Early Days Festival held at the Dian Linam farm. That harvest method was standard practice before windrowing by machine. The Early Days Festival has been held near Covington, PA for 44 years. It was held on the weekend of Sept. 12 this year. Ross Pino is the lead organizer. A few buckwheat seedlings in the spring are usually not a problem for most growers. Sometimes a field will have a lot after buckwheat, and they do become a weed issue. That’s worth avoiding. Besides, it’s a lot better to get paid for those seeds. Getting all the full seeds in the bin instead of on the ground is where the art of buckwheat harvesting comes in. Timing the harvest is the first step. If the plant is left standing too long, the seeds will shatter onto the ground either in a wind before harvest or when the reel hits the seed heads. Never rely on the presence of flowers or green leaves as a sign that you can wait. In a mild, moist fall, the time to harvest can come when the field still looks green and in bloom. Look at the filled seeds to see if they are turning color, and feel if they come off the head easily. Buckwheat kernels are not attached to the plant as tightly as small grains, and the attachment strength drops with time. A frost will weaken the peduncle quickly. That’s why growers who wait for a frost act quickly to combine once it comes. Pictured: buckwheat seedlings the spring after harvest. Harvesting after shattering has begun can put a lot of the yield on the ground. It doesn’t take much to get a vigorous stand of volunteers the next spring. Setting the combine. If there is a lot of green matter, and a lot of false kernels, the adjustments are challenging but possible. First, make sure that the stalks feed smoothly through and that your field speed doesn’t overload the screens. With a lot of green matter, it may take a little more time for the seeds to drop through. Setting the blower is also key. The blower should send the empty kernels out the back. That’s a subject covered in previous issues of this newsletter. There is no point in filling your truck with dockage! On the other side, the full kernels should not be coming out the back either. Usually it is best to start with the blower nearly all the way up, and back off until only empty kernels are passing through. Whether you are adjusting the feed or the blower, checking for full and empty kernels is important. Empty kernels look just like full kernels from a distance, so it’s worth checking closely. Northeast growers are fortunate in having fairly uniform ripening, so many of the grains are ready to come off at the same time. Pictured: buckwheat seedlings in trash from combine. Careful adjustment of the combine lets you get paid for these seeds. Some growers have observed weak fall growth in grains planted after buckwheat, and wondered whether buckwheat was doing something. In trials at the Geneva research station, we have made observations of this phenomenon to begin developing ideas about what is going on. We have also seen some instances where plots sown to fall grain do worse where there were buckwheat plots in the summer. Most of the time there is no difference, however. That difference means there is some management difference that’s important. The first observation is that grains seem to be suppressed if buckwheat seedlings are present at the same time. If the buckwheat had been harvested cleanly or cut before seed production (in cover crop trials), then the grains come up quickly, there was no observable suppression. We have also seen suppression of sudangrass in areas were there were a lot of buckwheat volunteers, but little where the buckwheat was managed so it didn’t sprout. We also tested a buckwheat nurse crop for switchgrass, letting the buckwheat grow just long enough for the switchgrass to emerge. That short exposure resulted in weak switchgrass stands that died over the next six months. The adjacent untreated plots were weedy, but the switchgrass thrived.